The food and beverage industry is seeing shifting consumer behaviors, particularly among younger consumers. These consumers—Gen Z and Millennials—differ from older generations in three main ways. First, they are more informed. For example, younger generations grew up in the information era and had exposé documentaries on the food industry baked into their middle school and high school educations. They absorbed this information as they were formulating their opinions and habits around food. This exposure to information makes younger generations more conscious consumers, meaning they focus on how their purchasing decisions impact themselves, the environment, and society. 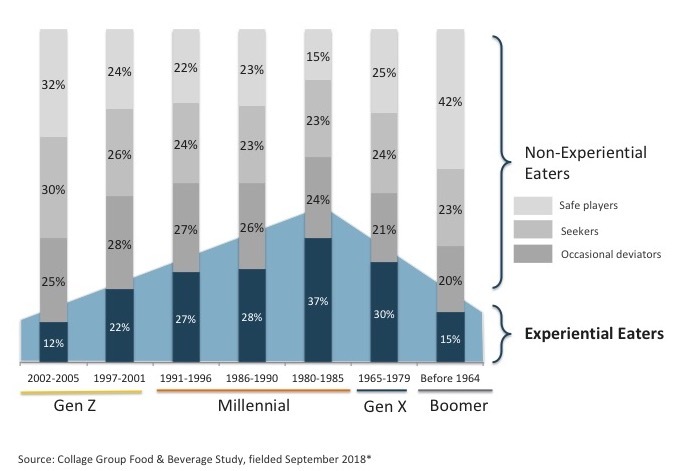 Second, younger consumers are experiential, as you can see in the graph below. They’ve become used to seeing a variety of beautifully presented food on social media and they in turn want their food to deliver experiences. Millennials in particular are more adventurous, have tried more “trendy” foods and beverages, and seek experiences when they dine out. For brands to keep up, they must know where the trade-offs lie and what they can do to garner the attention of these younger consumers. Third, Gen Zs and Millennials feel especially short on time. This bleeds into how they approach shopping, cooking, and dining. Marketers need to understand how these convenience-focused generations behave differently because of restricted schedules and help alleviate the anxiety around cooking. To support Collage Group members, we conducted two nationally-representative surveys of 2,880 and 2,877 respondents separately. With your input, we designed a series of questions testing key hypotheses on how Gen Z and Millennial consumers compare to older generations, and one another, when it comes to food and beverage. *Respondents were asked if they agreed to three statements, including: “I consider myself a foodie,” “I have a more adventurous palette than most people,” and “I like to eat foods from different cultures.” “Experiential Eaters” agree with all three. “Seekers” agree with any two statements. “Occasional Deviators” agree with just one statement. “Safe Players” agree with none of the statements. Note: agreement is top 2 box.